Just got this bit of news, Bleach the movie: X is playing in select theatres here in the states! 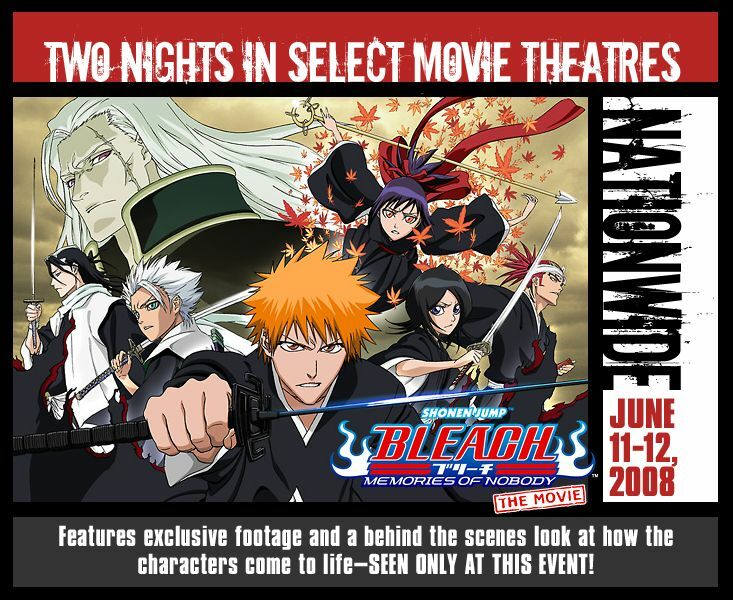 Tickets go on sale May 9th, and Bleach: Memories of Nobody hits theaters June 11-12, 2008. Along with the movie, there will be a special documentary on how the characters come to life, and special never before seen footage! After unidentified beings known as “Blanks” start popping up, they are soon followed by a Soul Reaper named Senna who makes them disappear. Puzzled by these unknown beings, and the even more mysterious girl, Ichigo and RUkia set out to learn more, but uncover an evil plot when a menacing clan tries to kidnap Senna. Banished from the Soul Society long ago, the clan’s leader is sending the World of the Living and the Soul Society on a collision course, and Senna seems to be the only key to his diabolical plot for revenge. Can Ichigo and his fellow Shinigami save the two worlds from annihilation?